Eric McClintock of FSBreak has posted the recording from last weekend's Avsim Town Hall Teamspeak Meeting. Several new development renders have been posted from the SOCATA TBM 850 project for X-Plane. FlyJSim has posted the first livery previews from the upcoming Boeing 727 Series for X-Plane in the X-Plane.org Forums. The freeware Australia Flinders Ranges photoreal scenery for X-Plane is now available to download at X-Plane.org. The Microsoft Flight Team has announced the Vought F4U Corsair DLC aircraft package to be available soon. Virtavia has posted the first preview screenshots from the upcoming Douglas A-4F Skyhawk for FSX at the Product Page. WSSimulation has released the Piper PA-46 Malibu Meridian for FSX. More information and purchase at SimMarket. Thai Creation has released Kathmandu Tribhuvan International Airport (VNKT) for FS2004. Available at SimMarket. - All major airport buildings included with high resolution textures and beautiful texture in the night time. - Real 3d ALSF-1 RWY 02 landing light system. - Much more to discover by yourself. AceFly has released the freeware Kiev photo scenery for FSX. Now available to download at AVSIMrus. Return to Misty Moorings has added the freeware Hollis Harbor scenery addon to the Orbx Pacific Fjords region. RealAir Simulations has posted daily screenshot number 10 from the upcoming Lancair Legacy for FSX. OZx has released the freeware Balgo Hill Airport (YBGO) scenery for FSX. Available to download at the OZx Website. MilViz has posted several external textures previews from the upcoming North American F-86 Sabre for FSX. Khamsin has announced next week's release of the freeware Boeing B-17G version 1.1 for X-Plane 10. Orbx has posted Some Newies and Impressions from the Monroe Firstair Field (W16) scenery for the PNW region. The first development screenshots from Shelter Cove Airport (0Q5) for FSX have been posted in the FSDeveloper Forums. FranceVFR has released Basse Normandie Photo HD for FSX. More information at the FranceVFR Website. FlightSim Greenland has released the Kangerlussuaq X scenery for FSX. Available to purchase at SimMarket. - Highly Detailed version of Kangerlussuaq Airport. - Custom made Seasonal Textures, and photo ground texture. - Custom made lakes, coastlines and streams. 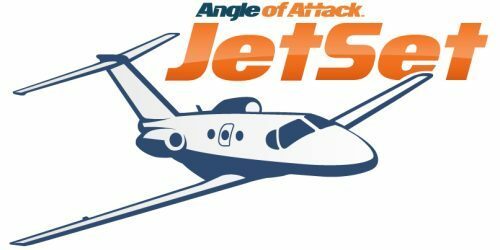 Chris Palmer from Angle of Attack has revealed more details from the upcoming JetSet FREE Jet Transition Video Course. 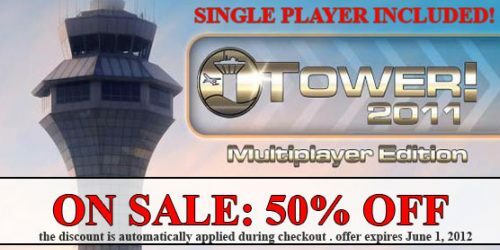 feelThere is now offering a 50% discount on Tower! 2011 Multiplayer Edition. Offer expires Friday June 1st 2012. Majestic Software has posted another teaser screenshot from the upcoming Bombardier Dash 8 Q400 for FSX. Blueprint Simulations has released Rio de Janeiro-Galeão International Airport (SBGL) for FSX and FS2004. - Accurately located aircraft parking positions around every terminal and individually customized static jetways at every gate. - A significant fraction of the general aviation, aircraft maintenance and cargo facilities within the field’s boundary. Abacus Publishing is offering 25% discounts on all titles during the Memorial Day Spring Savings Sale. A2A Simulations has posted this familiarization video from the soon to be released Accu-Sim P-51 Mustang for FSX. A-Flight has posted another teaser screenshot from the upcoming Helsinki-Vantaa Airport (EFHK) scenery for FSX. More development screenshots have been posted from the ongoing Mil Mi-17 project for X-Plane. MLADG has released the Aero Vodochody L-29 Delfín for X-Plane 10. Available at SimMarket and X-Plane.org. AeroSim has announced the soon to be released Boeing 787 for FSX. Details and screenshots at the Product Page. The Airport Guys has posted another teaser screenshot from the upcoming Virginia General Aviation Pack 1 for FSX. Thai Creation has added night lighting previews from the upcoming Kathmandu Tribhuvan Intl. Airport (VNKT) for FS2004. Flight Replicas has posted new virtual cockpit preview screenshots from the upcoming Messerschmitt Bf-109K for FSX. The freeware Grumman J2F Duck by Swingman has been converted to a FSX native model. Details in the SOH Forums. Bear Studios has released the updated Mikoyan-Gurevich MiG-17 for FSX, FS2004 and Prepar3D at SimMarket. - Eight MiG-17 main variant with 10 models for different payload configuration. - System simulations for radar, range and target designate equipments. - FSX VC model have shadow casting in SP5 for more realistic visual effect by casting cockpit equipment shadows on other panel and console surfaces. The recently released Flylogic Switzerland Small Airfields Part 4 scenery for FSX is now also available at SimMarket. - Numerous site-specific 3D objects around the airfield, such as farmhouses, barns, silos, roads, etc. GSNext has released the Beauvechain Air Base (EBBE) scenery for FSX. Now available to purchase at SimMarket. - Many other surprises you will discover if you purchase our product! RealAir Simulations has posted daily screenshot number 6 from the upcoming Lancair Legacy for FSX. McPhat Studios has posted several overhead panel previews from the upcoming Coolsky Douglas DC-9 for FSX. Grand Opening of the IRIS Flight Simulation Software Online Store, 15% discount coupon with newsletter subscription. New Zealand Vector Land Class (VLC) has posted the first preview screenshots from Murchison Airport (NZMR) for FSX. GrandSurf has announced that he will be switching his FSX scenery development work from fictional to a real destiation.